I love starting my day with steel-cut oats; but between my daily commute and my work schedule I don't often have the time. When I heard about Pacific Foods ready-to-eat Organic Steel-Cut Oatmeal I'll admit I was kind of curious and a little bit skeptical. But after one taste and I knew these oats would become part of my morning routine. Though the Pacific brand oatmeal comes in five delicious flavors, I prefer the unsweetened variety, since it allows me to add my favorite mix-ins. Some days it may be bananas & pecans while other days it's blueberries & coconut sugar. Whichever variety you choose it is great to know that it is a less processed option to instant oatmeal. Each individual serving box is packed with up to 7 grams of protein and 25-31 grams of heart healthy grains; two things that are very important to me. Not only are they a good choice for breakfast but they also are perfect to keep around as an easy & nutritious afternoon snack. Of course I'm thinking post workout...but they are ideal for any time you are looking for an energy boost. 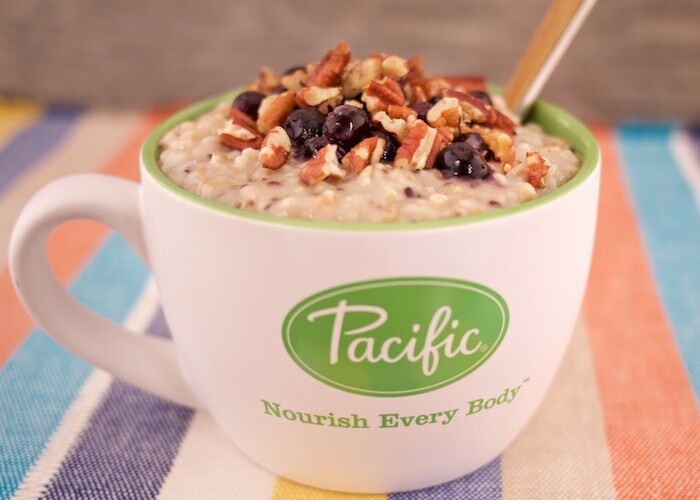 Pour Pacific steel-cut oatmeal into a bowl and microwave for 2-3 minutes. Top with blueberries and pecans and enjoy! What a great easy breakfast idea! Love your mix-in ideas. I'm loving the addition of blueberries and pecans! Such a yummy sweetness and crunch! This oatmeal is my new favorite! So easy and all good ingredients! Love blueberries in oatmeal! Sounds so good! I love steel cut oats, especially with fruit and a little bit of cream on top. This looks like the perfect breakfast, I love oatmeal! A hearty breakfast for the fall season! What a simple and yummy idea! Steel cut oats with fresh fruit is one of my favorite ways to start the day. Looks delicious! Love the blueberries and pecans.